Big Idea: Operating systems and software (Linux and open source), civil society, and businesses are increasingly utilizing open and collaborative processes to adapt to a complex, interconnected global environment. How can we apply these processes systemically in the education sector, which remains heavily constrained by bureaucracy? Before we dive deeper into Bentley’s insights, let me just plug in here that I have discussed elsewhere how open source governance models and process should be utilized in curriculum development. I’ve also argued for the great need for collaboration between teachers and other stakeholders in public education. In recognition of this need, let me furthermore give a shout out to The VIVA Project, which is working to craft innovative, direct collaborations between policymakers and educators that utilizes a process akin in spirit to that of open source. 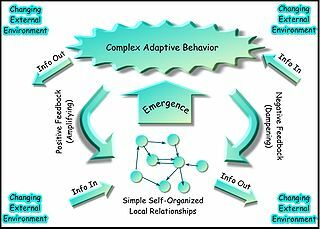 Much recent thinking about the shaping of social and economic behaviour has focused on the evolution, through open and self-organising processes, of complex adaptive systems. Rather than the formal, rational goals and accountabilities of the institutional framework, which is the focus of so much school reform, this thinking focuses on the patterns and dynamics of behaviour in systems which hold together without explicit systems of command. . . . . Specialization, interdependence, and self-organization. Those terms are aligned to the ecological principles that Will and I have been discussing here on this blog, such as niches, biodiversity, and succession. I like these new terms a little better, as they make more sense in the context of schooling, and I think I will adopt them in further explorations–if that’s alright with Mr. Bentley. Note also that Bentley clarifies a point I have made before, which is that when discussing a school ecosystem, we aren’t referring to wilderness, but rather a cultivated ecosystem for a specific societal purpose. Some of the most powerful educational innovations are disruptive: They require radically different patterns of organisation, using time, space, information and people differently in the learning process, in order to achieve their potential impact. But as Richard Elmore has persuasively argued, the multiple layering of organisational systems and authority, and the strong separation of the core technical and practical knowledge of teachers from the organisational knowledge and authority of educational administration, creates a potent “buffering” effect. Thus policy makers and experts are insulated from the classroom, and individual teachers are insulated from the expertise and exposure to new practice that might make them directly accountable for generating the best possible outcomes (Elmore, 2000). I also love this term: “buffering effect.” This is the argument I’ve been making when I’ve argued that policymakers are disassociated from the contexts and reality of the classroom. But there is a flip side to that coin, as Bentley points out, which is that teachers are also insulated from important knowledge outside their immediate sphere and practice. At the ground level, we are still coached and instructed in methods of identifying and teaching to childrens’ learning styles, when research is pretty clear that there’s no such thing. Teachers also tend to be fairly resistant to the few good things that do end up trickling down to us, due to oversaturation from fads and reforms. It’s important for us to also bear in mind that we must be welcoming to learning from policymakers, researchers, and other experts as well. But while the introduction of fresh external stimulus may be recognised as essential to the prospects of systemic change, how best to combine them with the resources of the existing system remains a challenge unmet. In short, educational reform has become more adept at creating new directions and new models in the last generation, but still struggles to gain leverage for these innovations across whole systems. Yes. We must leverage and recognize what works at the ground level. The current mentality of going to ‘war’ to promote education reform (I’m going to delve more into this topic soon when I discuss Paul Tough’s great book on Geoffrey Canada, Whatever It Takes) all too often disregards the value, expertise and knowledge already within the field. It’s worth listing the strategies for diffusion which Bentley outlines in his paper: imitation, iteration, improvisation, inspiration, immigration, and interpretation. It’s worth going into the paper, by the way, to examine Bentley’s explication of each of those strategies more in full. In fact, I think I’m going to have to steal some of those terms in further discussions of ecological principles, as well! These forms of learning, of course, feature in the repertoires of great teachers. Ironically enough, they rarely appear explicitly in innovation strategies designed for the larger systems that teachers inhabit. . . . . Yes. Ironic indeed. Our system, heavily focused on high stakes yearly testing, also too often constrains the very practices that educators know to be most effective in the classroom. Bentley then discusses an exciting model of these ideas for providing a learning community that offers a model of convergence of openness, innovation, complexity, and collaboration. Located in Hume, Australia, it is termed the Global Learning Village, and I’m excited by the potential transfer of some of these ideas to public schooling here. Children are expected to learn to do hard things in the absence of ever seeing experts at work doing such things—to become shoemakers when they’ve never seen shoes or a shoemaker making them. We’ve cut kids adrift, without the support or nurturance of grown-ups, without the surrounding of a community in which they might feel it safe to try out various roles. Creating a positive, dynamic, inclusive learning community that is a real community that extends beyond the limited, prescribed notion of a K-12 factory that only focuses on the learning of children . . . Yes, that is precisely what I believe folks like Sir Ken Robinson are talking about when they discuss the need for a focus on ennabling creativity and innovation in schools. Will Johnson has also pointed out how the relationships between students and teachers should more rightly be perceived as symbiotic. ways of meeting them, is openly shared. This is an important point to make. I’ve also noted that child-centered education does not obviate our responsibility to provide guidance to children, nor to teachers on matters of curriculum. What is important is that our governance models are transparent, open, and clear. It is precisely that lack of guidance and clarity that is one of the biggest issues in schools today. I urge you to read Innovation and Diffusion as a Theory of Change in its entire. I apologize for the amount of self-referential links and comments I’ve made here; I get excited when I come across something that so closely aligns with our model of schools as ecosystems! How Can We Cultivate Abriculture in Our Communities?